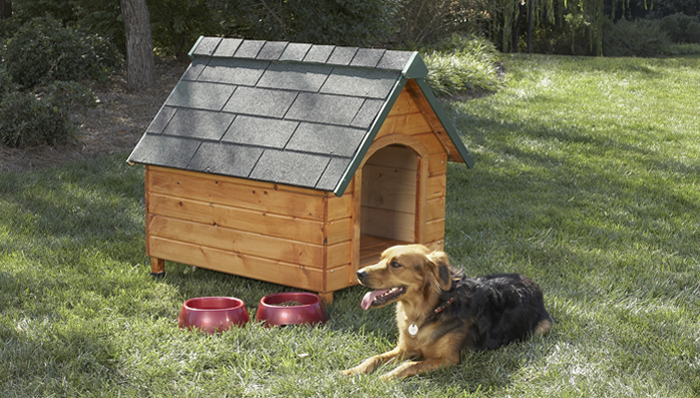 A dog house is easy to assemble if you have the very basic skill of woodworking and some free time. The most essential part is the basic layout plan that would work in your garden/house/yard. Not everyone could think of one by himself, as it requires more skill in layout and architecture. Luckily, the internet has amazing free resources of totally free Pet House plan layout that you could take sneak peek at for inspiration. They are scattered around the web, and we have taken the liberty to put it into one place for your easy convenience. Feel free to browse through the top 5 dog house plan layout that work for you. Nothing can get more basic than this one. This guide literally takes your hand through all the steps there are to make a dog house. As long as you have all the tools it requires, such as the impact driver and a basic miter saw, with the basic skills to use them, you are good to go. Can never go wrong with this guide. Lowes is a great brand where it comes to everything about tools online, and they have a dedicated section for DIY enthusiasts. This dog house plan, put together by Lowes’ team, is the best for beginners, as it is very simple and require basic skills to follow. The article is laid out nicely, with what to prepare, steps to take and what to expect for the final work. Well, if you are looking for something fancier, then this guide would not disappoint you. Put together by the team at Better Home & Gardens, it gives you the three screenshots of the plan. Just download and print out the plan, and follow it. I would admit it is a bit harder to comprehend, and would require a little bit more skill to reach the final intended dog house as plan. If you look at the above dog house plan, they are a little bit just the same. Well, this is something different for your taste, as it features how to build an A-framed dog house. This house type is perfect for small and medium-sized dog, and in my opinion quite easy to follow. Another great piece from Instructables site! If your dog is a little medium to big size, opt for this house guide from Ana White. The frame is structured to have more space to house your lovely dog, so you could nicely place some more pillows to make him/her more comfortable. The guide lists out diligently what tools you need to buy, and step by step picture on how to put them together. Medium skills required though, but with certain guidance from the experienced, beginners could tackle this project too! As a dog owner, I love my dog to the fullest, and I know exactly the emotions and attachement you feel when you build a house for your lovely dog by yourself. It may not be the best dog house in the neighborhood, but I am pretty sure your dog would not care at all. Treasure your best friend, and he will do the same to you. Wish you could follow all the nice dog house layout plan above, and have a great finished dog house.